1. Ph.D program in Clinical Biochemistry and Molecular Medicine, Department of Clinical Chemistry, Faculty of Allied Health Sciences, Chulalongkorn University, Bangkok 10330, Thailand. 2. Department of Chemistry, Colorado State University, Fort Collins, Colorado 80523, United States. 3. The School of Biomedical Sciences, Institute of Health and Biomedical Sciences, Queensland University of Technology, Brisbane, Queensland, 4059, Australia. 4. Department of Clinical Chemistry, Faculty of Allied Health Sciences, Chulalongkorn University, Bangkok, 10330, Thailand. 5. Electrochemistry and Optical Spectroscopy Center of Excellence, Chulalongkorn University, Bangkok, 10330, Thailand. 6. Department of Chemical and Biological Engineering, Colorado State University, Fort Collins, Colorado 80523, United States. Rationale: Saliva as a sample matrix is rapidly gaining interest for disease diagnosis and point-of-care assays because it is easy to collect (non-invasive) and contains many health-related biomarkers. However, saliva poses particular problems relative to more common urine and blood matrices, which includes low analyte concentrations, lack of understanding of biomolecule transportation and inherent viscosity variability in human samples. While several studies have sought to improve assay sensitivity, few have addressed sample viscosity specifically. The goal of this study is to minimize the effect of sample viscosity on paper-based analytical devices (PADs) for the measurement of pH and nitrite in human saliva. Methods: PADs were used to measure salivary pH from 5.0 to 10.0 with a universal indicator consisting of chlorophenol red, phenol red and phenolphthalein. Nitrite determination was performed using the Griess reaction. Artificial saliva with viscosity values between 1.54 and 5.10 mPa∙s was tested on the proposed PAD. To ensure the proposed PADs can be tailored for use in-field analysis, the devices were shipped to Australia and tested with human specimens. Results: Initial experiments showed that viscosity had a significant impact on the calibration curve for nitrite; however, a more consistent curve could be generated when buffer was added after the sample, irrespective of sample viscosity. The linear range for nitrite detection was 0.1 to 2.4 mg/dL using the improved method. The nitrite measurement in artificial saliva also showed a good correlation with the standard spectrophotometry method (p=0.8484, paired sample t-test, n=20). Measured pH values from samples with varying viscosities correlated well with the results from our pH meter. Conclusions: The inherent variation of salivary viscosity that impacts nitrite and pH results can be addressed using a simple washing step on the PAD without the need for complex procedures. Saliva has the potential to be an ideal medium for conducing point of care diagnostics as 30% of the molecules present are in circulation in the blood and specimen collection is non-invasive [1-3]. Generally, saliva is composed of 99.5% water, 0.3% proteins and 0.2% inorganic markers and trace substances . Saliva contains many types of biomarkers including glycoproteins, immunoglobulins, blood type substances, enzymes, electrolytes and hormones [4-6]. In addition to biomarkers and water, saliva also contains shaded squamous epithelial cells, white and red blood cells, microorganisms, and high molecular weight mucins [1, 7]. The limitations, however, to the use of saliva as a diagnostic medium include the lack of standardized sample collection devices, low analyte concentrations (pg/mL), diurnal variations of some analytes, and vary significantly in physical properties such as viscosity [1, 4, 5]. Therefore, the process for collection and preparation of oral fluids is of importance. Generally, the rheological behavior of saliva is based on viscous and elastic properties resulting from mucin conformation and/or the mucin type within glandular saliva [8, 9]. Moreover, salivary viscosity can vary with numerous manipulations such as collection, handling, ultrafiltration and carrying out analytical measurements. Precipitation of mucins using chemicals such as cetyltrimethylammonium bromide or adjusting the pH, which can also decrease viscosity [4, 7]. These methods, however, can influence the biomolecules of interest and may impact on the biomolecular composition in saliva . To design point of care devices that are amenable for use in remote resource limited areas, protocols should avoid the use of sophisticated equipment such as a centrifuge as they may not be available; hence, simple and low-cost methodologies should be incorporated in devices such that testing can be done in the field. Nitrite and pH are the most of common inorganic markers that have been investigated in saliva [6, 10]. The nitrite levels are dependent on the nitrate uptake from foods or drinks . Approximately 25% of oral nitrate intake from food is concentrated and excreted by salivary glands and is reduced to nitrite by facultative anaerobic bacteria [11-13]. Therefore, salivary nitrite can be used for monitoring whether sufficient, safe or excessive levels of nitrate consumption is being practiced . Moreover, nitrite can react with secondary amines and amides to form various N-nitroso compounds . Several studies have been reported highlighting the carcinogenicity of these N-nitroso compounds in animals and in higher primates . In addition, nitrite might be used as a biomarker for oral cancer due to elevated nitrite levels in saliva from oral cancer patients when compared to saliva collected from healthy individuals . Besides being a biomarker for oral cancer [17, 18], nitrite levels in saliva might be useful for diagnosis and monitoring in periodontal disease and previous studies have been reported the severity of periodontal disease related to salivary nitrite concentration [13, 19]. Additionally, high levels of nitrite can react with hemoglobin to develop methaemoglobinaemia in infants, a condition where elevated levels of methemoglobin are present in the blood . Salivary pH is also a valuable biomarker for determining the pH balance in the mouth. Changes in pH are typically controlled through food and beverage consumption as well as oral diseases like tooth decay and gum diseases . In healthy individuals, nitrite levels in saliva range from 6 to 10 ppm (0.6-1.0 mg/dL)  while pH in saliva ranges between 6.2 and 7.6, generally . pH values outside these ranges are indicative of several symptoms. For example, dental decay, halitosis, and periodontitis generate a chronic academia condition while plaque formation causes a mildly alkaline pH . Moreover, both nitrite and pH biomarkers are associated with end stage renal disease . Numerous methods have been reported for the determination of nitrite, however the most frequently approach is a spectrophotometric method based on Griess test. Ion chromatography, electrochemical detection and capillary zone electrophoresis have also been developed to quantify nitrite. Using these techniques often requires complex preparation processes such as centrifugation to remove insoluble substances and dilution to minimize the effect of protein contained in the matrix [21-23]. Paper-based analytical devices (PADs) as demonstrated by Whitesides's group  offer a promising solution for point-of-care diagnostics [25-27]. PADs can provide potentially relevant analysis for biomarker detection in many types of biological fluids, including tear fluids [28, 29], whole blood [30-32], serum , urine  and saliva [35-37]. To date, the development of PADs for saliva analysis have been reported for biomarkers such as nitrite , thiocyanate  and aldehydes  using colorimetric assay and dengue specific antibodies using stacked flow immunoassay . In the case of immunoassays, the impact of viscosity from mucin, proteinaceous and viscous substances was reduced using a stacked flow device. In this case, glass fiber was used to remove proteinaceous substances and cellular debris from saliva and a flow regulator was used to regulate the flow in strip . A vertical flow immunoassay was also developed for the detection of matrix metalloproteinase-8 and -9 where the viscous mucin was removed by freezing, thawing, and centrifuging the sample before testing on PADs . While this method was effective at reducing the viscosity issue, it would be difficult to implement this sample pretreatment step in the field. In general, methods reported to date have been effective at addressing sample variability but require relatively complex procedures and/or external equipment that is not desirable for point-of-care assays in remote settings. Here, we report a PAD for determining nitrite concentration and pH in saliva that addresses the viscosity issues associated with saliva samples. After adding sample to the PAD, a washing buffer was added to the device inlet to direct analytes to the detection zones where they can react with pre-immobilized reagents. This simple approach reduces the impact of salivary viscosity variation on accurate nitrite and pH quantification in resource-limited settings. All reagents were used as purchased. Chlorophenol red, trisodium citrate dehydrate and albumin, human 96% were purchased from Alfa Aesar. (Ward Hill, MA, USA). Phenol red, sodium phosphate monobasic, hexadecyltrimethylammonium bromide (CTAB), borax, sulfanilamide > 99%, N-(1-naphthyl)ethylenediamine dihydrochloride > 98%, nitrite standard for IC 1,000 mg/L ± 4 mg/L, carboxymethylcellulose sodium salt, potassium phosphate monobasic anhydrous, potassium phosphate dibasic anhydrous, sodium fluoride 99%, D-sorbitol ≥ 98%, D-(+)-glucose, ascorbic acid and α-amylase from Bacillus licheniformis were purchased from Sigma-Aldrich (St. Louis, MO, USA). Phenolphthalein was purchased from Flinn Scientific Inc. (Bratavia, IL, USA). Citric acid monohydrate, sodium phosphate dibasic, potassium chloride, magnesium chloride and calcium chloride were obtained from Fisher Scientific (Pittsburgh, PA, USA). Methyl 4-hydroxybenzoate was obtained from TCI America (Portland, OR, USA). Sodium chloride was purchased from Avantor Performance Materials, Inc. (Phillipsburg, NJ, USA). Lysozyme, chicken egg white was obtained from Calbiochem®, Darmstadt, Germany. The PADs were fabricated using a wax printing technique . In brief, the patterns were printed using wax printer (Xerox, ColorQube8870) on Whatman Grade 1 qualitative filter paper (Cat No. 1001-185, GE Healthcare UK Limited, UK). The PADs were then heated on hotplate at 150 ºC for 2 min to ensure the wax melted and coated the cellulose fibers, creating hydrophobic barriers to manipulate fluid flow. The PAD design consists of one sample area, five sensing areas and two control areas. After the heating step, the pH and nitrite sensing areas had 2 mm and 4 mm diameters, respectively. The sample area for the saliva specimen addition was 7 mm in diameter. The PADs analyzed the pH values using three different of pH indicators, (1) chlorophenol red, (2) phenol red and (3) phenolphthalein. The indicators were prepared as follows: (1) dissolved 12.69 mg of chlorophenol red, 43.69 mg of CTAB in 20 mL of distilled water, and (2) 7.13 mg of phenol red, 32.80 mg of CTAB and 20 µL of 0.1 M NaOH in 20 mL of distilled water . The phenolphthalein indicator (3) was used for measuring the pH greater than 8.2 and this indicator was produced by dissolving 3.1 mM of phenolphthalein in ethanol (50%, v/v) . To create pH sensing areas, 0.2 µL of each phenolphthalein and chlorophenol red were deposited into their sensing area; 0.4 µL of the phenol red indicator was deposited into its respective sensing area. The nitrite determination on the PADs was performed using the Griess reaction. The nitrite detection reagent contains 50 mM of sulfanilamide, 330 mM of citric acid and 10 mM of N-(1-naphthyl) ethylenediamine dihydrochloride. Working solutions were prepared daily by dissolving the reagents in phosphate buffer (pH 7.2) and kept in the dark until use to avoid reagent degradation in solution. For the quantification of nitrite, 0.5 μL of the nitrite detection solution was added to the sensing and control areas, then left to dry in the dark for 10 min. The artificial saliva was prepared to mimic saliva fluid composition based on sodium carboxymethylcellulose (SCMC) to produce solutions of varying viscosity . The artificial saliva solution contained various concentration of SCMC, 0.62 g of potassium chloride, 0.87 g of sodium chloride, 0.06 g of magnesium chloride, 0.17 g of calcium chloride, 0.8 g of di-potassium hydrogen orthophosphate, 0.3 g of potassium di-hydrogen orthophosphate, 0.0044 g of sodium fluoride, 29.95 g of sorbital and 1 g of methyl 4-hydroxybenzoate in 1000 mL of deionized water. The concentration of SCMC was varied in range of 0.25, 0.50, 0.75, 1.00, 1.25 and 1.50 %(w/v) to mimic human saliva viscosity. The viscosity measurement of artificial saliva was performed using a m-VROC small sample viscometer (RheoSense, Inc). The procedure for pH and nitrite determination on PADs was as follows: 13 μL of artificial saliva was added to the sample area. After saliva solution wicked into sensing areas in the PADs, the pH sensing area was imaged using a smartphone and the color formation was compared with pH color scale. Naked eye comparison of the pH sensing area and the pH color scale was also performed. Then, 10 μL of the buffer was added to sample zone to aid transport of the viscous saliva to the detection areas. After all of the device manipulations, an image was recorded on a flatbed scanner (Xerox, DocuMate 3220) and the color intensity of the image was analyzed using Adobe Photoshop® CC 2015. The color intensity was calculated by analyzing the magenta channel in Photoshop® (CMYK mode) and compared to the calibration curve for quantifying concentration of nitrite. The schematic for pH testing and nitrite determination are shown in Figure 1. Image of the PAD and scheme for pH and nitrite determination. Step 1 describes the process for naked eye determination of the pH. The black circle indicates the position for pH measurement. The color inside the black circle is then compared to the pH color scale for pH determination. Step 2 describes the process for quantifying color intensity measuring using the program Photoshop® for nitrite concentration determination. The concentration of nitrite in saliva samples was calculated from the calibration curve. The pH color scale was created using three different indicators and tested with three common buffers (citrate, phosphate and borate), which covered the pH range from 5.0 to 10.0. The pH color scale for saliva diagnosis was generated using artificial saliva. The pH was adjusted using aliquots of 1 M HCl or 1 M NaOH to cover the pH region from 5.0 to 10.0. Additional information on the preparation of the scales is available in the supplementary information. The analytical range for nitrite measurement in saliva samples was determined using artificial saliva containing 1.00% SCMC. The nitrite standard was spiked into saliva solutions to obtain test samples with concentrations ranging from 0 to 3.2 mg/dL. The test samples were then analyzed on the proposed device. This nitrite concentration range covers the clinical reference interval for nitrite in saliva . Artificial saliva with 0.50% SCMC and 1.50% SCMC were prepared with nitrite concentrations ranging from 0.1 to 2.4 mg/dL, and used to ascertain the impact of saliva viscosity during measurements. Varying sample viscosities to simulate human sample analysis was then studied. The measurement process was divided into three parts. First, pH values of artificial saliva were adjusted to obtain a range of pH values with 1 M NaOH and 1 M HCl. The viscosities of these samples ranged between 1.54-5.10 mPa∙s and were tested on the PADs. The results from proposed PADs were compared with a Sartorious PR-50 pH meter, Sartorius Corporation (Bohemia, NY, USA.). Second, artificial saliva samples with viscosities of 1.54-5.10 mPa∙s were spiked with different nitrite concentrations, and then analyzed for nitrite and pH using the PADs. The nitrite level on PADs were compared with the standard electronic absorbance spectroscopy (UV-vis) protocol using an Agilent 8453 UV-visible spectroscopy. The spectroscopic determination of nitrite was carried out by mixing 100 µL of the Griess reagent (Griess Reagent Kit for Nitrite Determination, G-7921, Molecular Probes), 300 µL of the nitrite-containing sample and 2.6 mL of deionized water. The mixture was incubated for 30 min and the absorbance at 548 nm was measured. Third, the device was shipped to Brisbane, Queensland, Australia for measurement of nitrite concentration and pH in human samples. The effect of interfering substances on nitrite and pH measurement in saliva was investigated. Several common interfering constituents in human saliva, including glucose, α-amylase, lysozyme, human serum albumin and ascorbic acid were spiked into an artificial saliva with a final nitrite concentration of 1 mg/dL between pH 7.2-7.4; these samples were then tested on proposed PADs. To improve the stability of this device, the PADs were kept at room temperature and 4 ºC in an evacuated mylar bag created using a vacuum sealer (PAC Machinery CV-151G model). (A) Photographs of increase in saliva viscosity on Whatman No.1 channel and the zoom-in of the saliva fronts represent in figure A (upper). (B) The correlation of concentration of SCMC in artificial saliva and distance of solution moving along the channel (n=5). The viscosity of human saliva has been shown to be non-Newtonian, therefore the viscosity was found to be inversely proportional to shear rate . Moreover, the viscosity of saliva depends on the saliva collection methods and type of saliva: stimulated parotid saliva, 1.33 ± 0.29, stimulated whole saliva, 1.91 ± 0.54, unstimulated whole saliva, 2.52 ± 0.59 and stimulated submandibular-sublingual saliva, 3.88 ± 1.12 mPa∙s . To create artificial saliva of varying viscosity as a Newtonian fluid, sodium carboxymethyl cellulose (SCMC) was used . The mean viscosity of the artificial saliva contains 0.25, 0.50, 0.75, 1.00, 1.25 and 1.50 % (w/v) of SCMC is 1.54, 1.87, 2.18, 2.73, 4.17 and 5.10 mPa∙s, respectively. The data of shear rate and mean viscosity are provided in Table S1. The impact of saliva viscosity in range of 1.54 to 5.10 mPa-s on flow in filter paper was investigated. For these studies, the PADs had a 7-mm diameter sample inlet, 1.5 mm channel width and 60 mm channel length. The distance the fluid travelled was measured after the solution evaporated. As expected, the distance the fluid travelled was proportional to the saliva viscosity as seen in the photographs and plot in Figure 2. In addition, a movie of the phosphate buffer and healthy human saliva sample flowing through the PAD were recorded and are provided in the supplementary section. The movie was recorded for 10 min using a smartphone camera. To more clearly observe the distance sample travelled, an iMovie application was used to process the movie to adjust the contrast between solution in paper channel and wax barrier. In the supplementary data, the duration of the movie is 30 s with a 20X increase in speed. Next, the impact of the viscosity on the colorimetric assay on the PAD by spiking a constant concentration (2 mg/dL) of nitrite into artificial saliva of varying viscosity and then observing its colorimetric response. The same volume of saliva was added on each PAD and allowed to react until the sample dried. As expected, the increasing salivary viscosity retards the fluid dispersion. However, an unexpected result of changing the viscosity was the dramatic change in the resulting nitrite signal despite the same nitrite concentration. As a result, any change in salivary viscosity would render a human nitrite test unreliable. The addition of a washing step has shown to increase sample transport down the channel in the PAD . This washing step was tested with deionized water and various buffers. The effect of the deionized water and buffer pH on the colorimetric detection was investigated (results shown in Figure S1A). After using deionized water and different types of buffer solutions, the color intensity was not significantly different when compared with deionized water (p > 0.05, t-test). Although using deionized water is cost-effective, a benefit to using a buffer system can resist and maintain pH better than deionized water . The production of a reddish-purple colored azo dye in Griess assay requires an acidic environment; however, nitrite in the sample is unstable under acid conditions . Therefore, a phosphate buffer at pH 7.2 to replicate the salivary pH of healthy individuals . The color intensity of nitrite at concentrations of 0.5 mg/dL and 1 mg/dL in artificial saliva containing 1.00% SCMC was not significantly different when compared with deionized water (p = 0.501 and 0.06, respectively, t-test, n=4, Figure S1B). Next, the effectiveness of the washing step to improve sample transport was tested. The phosphate buffer at pH 7.2 was added to the sample area after the saliva was initially added to the PAD, with the results shown in Figure 3. The images in Figure 3A show the improved color distribution after the buffer washing step. The color intensity in the detection areas was also determined and the relationship between the viscosity and color intensity is shown in Figure 3B. The buffer washing step proved effective at providing a constant signal for samples with varying viscosities. While there is some variation in the intensity as a function of saliva viscosity, it is not statistically significant at the 95% confidence interval (with saliva viscosity 1.87, 2.18, 2.73, 4.17, and 5.10 mPa∙s respectively). The variation that does occur is likely because, at lower viscosity, the sample is pushed further towards the edges resulting to a small loss of sample. This could be addressed in the future by modifying the paper to control spreading [46,49]. The implications of this washing step reducing issues of varying salivary viscosity is promising for saliva diagnostics. (A) Images showing the color formation before and after washing with phosphate buffer. (B) Plot showing color intensity of artificial saliva with 2 mg/dL as a function of SCMC concentration after buffer washing step (n=6). The pH sensing areas were placed in close proximity to the sample application area, to ensure the specimen completely flowed to detection area quickly (within 1 min). The impact of pH analysis on accurate quantitation of nitrate was tested to ensure there was no interference between the two assays. First, pH analysis on PADs were completed with different salivary viscosities to show that the viscosity changes did not affect the pH assay. Figure 4A represents the color transition of three pH indicators including chlorophenol red, phenol red and phenolphthalein against buffers ranging in pH from 5.0 to 10.0. Figure 4B represents the pH color transition when tested with artificial saliva contained pH in range 5.0 to 10.0. Chlorophenol red shows color transitions from yellow to violet at a pH range of 4.8 to 6.7, phenol red transitions from a yellow to red color in the pH range of 6.8 to 8.2 and phenolphthalein transitions from colorless to a red color in the pH range of 8.0 of 10.0. Interestingly, when CTAB was added to the chlorophenol red indicator, the color changed from yellow to green. For this study, the pH value was analyzed by naked eye; therefore, a pH color scale was established against citrate (pH 5.0-5.8), sodium phosphate (pH 6.2-8.0) and a borate buffers (pH 8.5-10.0) ranging in pH from 5.0 to 10.0. The resulting color scale is shown in Figure 4A. We then repeated this experiment using artificial saliva adjusted to pH 5.0 to 10.0 and found that the colors were visibly different between the two sample types. 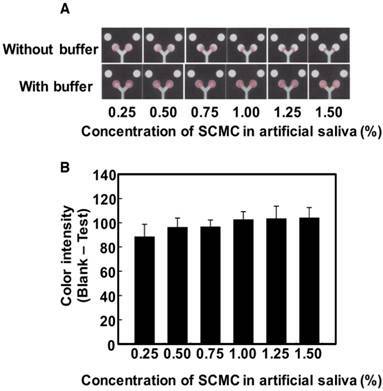 As shown in Figure 4, the indicator's color intensity using the buffers showed a steeper color change or more noticeable color change when compared to the color produced using the artificial saliva. The viscosity of the fluid is related to the rate at which the solution is transported by the paper, resulting in minimal color change in artificial saliva . Therefore, a pH color scale of artificial saliva adjusted from pH 5.0 to 10.0 was established to measure salivary pH. The modified scale is shown in Figure 4B. The performance of PADs for detecting pH in saliva and the images of pH color change on PADs were shown in Table S2. It was found that the pH values measured on the PADs were in good agreement with the data from pH meter. In our study, the pH range of the proposed device covered the range for healthy individuals (pH 6.2-7.6) . A previous study found that the pH values in oral cancer patients shifted towards acidic pH due to the lactic acid production of tumor cells by anaerobic metabolism . Therefore, salivary pH might be useful as a non-invasive prognostic indicator for oral cancer . Next, we analyzed nitrite in real samples using the device design shown in Figure 1. Control areas were created on the PAD and the mean color intensity of each concentration was calculated by subtracting the intensity of the test areas from the intensity of the control areas to eliminate any background signal. The curve shows increasing intensity with increasing nitrite concentration after adding buffer. Under optimal conditions, the PADs generated a linear colorimetric response (y=32.594x + 36.080, R2=0.997) nitrite levels between 0.1 to 2.4 mg/dL of nitrite (Figure 5). These concentrations cover the nitrite values in healthy people (0.6-1.0 mg/dL of nitrite). Next, calibration curves of nitrite with varying viscosity (0.50% SCMC and 1.50% SCMC) were created. The respective calibration equations of 0.50% SCMC and 1.50% SCMC were y=31.291x + 35.270 (R2 = 0.999) and y=32.545x + 34.569 (R2 = 0.994). The data is shown in Figure S2. It can be concluded that the viscosity of artificial saliva did not affect the slope of the calibration curves resulting in a technique that is independent of saliva viscosity. 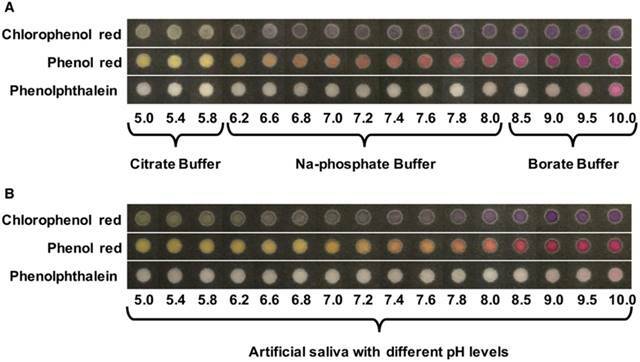 Images of paper pH color scales against buffers and pH adjusted artificial saliva (A) pH color scales generated by three pH indicators: chlorophenol red, phenol red and phenolphthalein against citrate buffer, sodium phosphate buffer and a borate buffer. (B) pH color scales generated by three pH indicators against artificial saliva containing 1.00% SCMC with pH ranging from 5.0 to 10.0. Calibration curves displaying the linear range of nitrite, from 0.1 mg/dL to 2.4 mg/dL of nitrite in artificial saliva containing 1.00% SCMC (n=6). The images shown on the right side of calibration curves correspond to the different nitrite concentrations tested on the PADs. After the analytical range for the PAD was established, the utility of the proposed device for human saliva analysis was demonstrated. For quantitative analysis, the nitrite level in the saliva specimen was calculated by first subtracting the color intensity of the control areas from the color intensity of the test areas. This value was then compared to the calibration curve to determine the nitrite concentration. Twenty artificial saliva samples differing in nitrite, pH and viscosity were analyzed using the device. The pH results were compared to a pH electrode and the nitrite values were compared to those generated by the spectrophotometric Griess method. As shown in Table 1, the pH values measured by the PADs and the pH meter were statistically similar. Furthermore, the measured nitrite concentrations were statistically similar between the PADs and the spectrophotometric method at the 95% confidence interval (pair sample t-test, p value = 0.8484). A Bland-Altman plot and Passing-Bablok regression were used to analyze the agreement between the standard spectrophotometric method and proposed PADs. As shown in Figure S4A, nineteen samples had no bias for nitrite determination because the differences between the two methods fell within the mean ± 1.96 SD. One sample contained nitrite level 2.44 ± 0.007 mg/dL was presented over the mean +1.96 SD. The one outlier might have occurred due to the level of nitrite being near the upper limit of the analytical range. A Passing-Bablok regression was employed to assess the correlation of the methods, for which the equation y = 0.991x + 0.0169 was obtained. No significant deviation from linearity (P = 0.36) was observed, as shown in Figure S4B. Therefore, the proposed PADs can be used as a quantitative nitrite assay in real saliva samples and exhibit good agreement with Griess assay by spectrophotometric detection. To test device stability, PADs were shipped to Australia and tested with real saliva specimen from four healthy controls using the established saliva collection protocols from Punyadeera team [52-54]. These samples contained different levels of C-reactive protein (CRP), including two samples with normal level of CRP (0 and 124.71 pg/mL) and two samples with high levels of CRP (4655 and 17,849 pg/mL). Interestingly, the results showed that the color change in the nitrite detection area correlated well with the CRP levels. Clinically, CRP is a systemic biomarker related to periodontal disease; increasing levels of CRP and nitrite have also been found in saliva of patients with periodontal disease . As a result, the nitrite determination in this PAD can be used as an alternative to CRP detection for periodontal disease diagnostics. Besides nitrite testing, our proposed devices also detected both normal and high pH levels in saliva specimen. The data were represented in Figure S5. According to the manufacturer, the mixture of Greiss reagents should be stored and used within 8 h because N-(1-naphthyl)-ethylenediamine is easily oxidized by air and ambient light . Several studies have reported strategies to protect the reagent from degradation such as separating the components of the Griess reagent  or the addition of Nafion™ to the nitrite cocktail to avoid leaching of the cationic azo-dye formed by the reaction . Hence, the lifetime of the PADs was evaluated under different storage conditions. Device stability was investigated by monitoring the background color change on PADs, testing with artificial saliva containing 1 mg/dL of nitrite and examining the pH of saliva. The response of the color background and nitrite level after storage during extended time periods at room temperature (25 ºC) and 4 ºC is shown in Figure 6. PADs stored at room temperature revealed a gradually decreasing signal over time. However, the background color was stable for 10 days when stored at 4 ºC. To ensure the stored devices retain the ability to measure nitrite and pH, they were used to quantify nitrite in artificial saliva containing 1 mg/dL and salivary pH at values of 5.65, 7.13 and 10.19. Quantification of these markers was observed over 30 days (Figure 6 and Table S3). According to the results, it can be concluded that the storage of PADs at 4 ºC provides stability for nitrite and pH measurement for at least 30 days. However, the color change for phenolphthalein indicator at the higher pH faded after 2 weeks. The increasing of background color intensity on the PADs may be the result of Griess reagent degradation . Nonetheless, these problems can be overcome by storage in a vacuum bag, being protected from light, maintaining the device at 4 °C, and using a control area for subtracting color background. 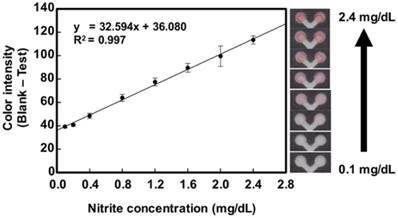 To investigate potential of interference in the quantification of pH and nitrite, saliva solutions with pH 7.2 to 7.4 and containing 1 mg/dL of nitrite were used to analyzed. Different concentrations of substances were spiked into these fluid follows: human serum albumin (0-5 mg/mL), glucose (1-10 mM), lysozyme (0-600 mg/L), amylase (0-1000 U/mL) and ascorbic acid (0-5 mg/dL). Table 2 illustrates the effects of interfering substances on nitrite measurement using proposed PADs. Tabulated pH values and nitrite concentrations in artificial saliva samples spiked with different concentrations of nitrite using our PADs compared to standard methods. (A) The color background of the Griess reagent on the PADs as a function of time at room temperature (closed circles, ⚫) and 4 ºC (open circles, ⚪) (n=8) (B) Nitrite concentration on PADs as a function of storage time calculated from analytical calibration (n=6). Percent recovery effects of the interfering substance on nitrite assay using proposed devices. Proteins and compounds such as ascorbate and sulfhydryl-containing the interfering substances have been shown to interfere with the Griess reagent . The conventional spectrophotometric method recommends that interfering proteins and high molecular weight of mucin should be removed by precipitation or ultracentrifugation  before using the assay. Previous studies have reported the concentration of substances in saliva including albumin in the range of 0.12 to 0.23 mg/mL, salivary glucose in the range of 1.08 ± 0.306 mM in diabetic patients and 0.43 ± 0.134 mM in non-diabetic subjects, salivary amylase in the range of 40 to 120 U/mL, and salivary lysozyme in the range of 70-180 mg/L [58-60]. Ascorbate is a redox agent that effects the pigment production and is present at a wide concentration range, 0.07 to 0.25 mg/dL . Using proposed devices, all but the 0.5 mg/mLof human serum albumin, 100 U/mL α-amylase, 50 mg/dL of lysozyme and 0.5 mg/dL of ascorbic acid were not found to significantly interfere (< 99%) with the system. We successfully developed a paper-based analytical device (PAD) for simultaneous determination of pH and nitrite on the same device that addresses varying sample viscosity, a common issue in analysis of real saliva samples. The inherent variation in salivary viscosity that impacts results can be addressed by using a simple washing step on the device without the need for arduous or complicated procedures. Based on these results, the proposed device offers utility for screening of nitrite concentration and pH for monitoring oral cancer periodontal disease, respectively. The PADs utilize low-cost fabrication, fast analysis, acceptable response ranges for clinical saliva analysis, long stability and are environmentally friendly to use. Moreover, this system is not confined to a colorimetric assay but will benefit from other techniques such as immunoassay and fluorescence detection methods for saliva analysis. For real sample analysis, the study was approved by the Queensland University of Technology, Brisbane, Australia [HREC No: 1400000617 and 1400000641]. PADs: paper-based analytical devices, USA: United States of America, CTAB: hexadecyltrimethylammonium bromide, NaOH: sodium hydroxide, SCMC: sodium carboxymethylcellulose, HCl: hydrochloric acid, UK: united kingdom, CRP: c-reactive protein. J.N. gratefully acknowledges the Thailand Research Fund through the Royal Golden Jubilee PhD Program (Grant No. PHD/0017/2556). This research was financially supported by Colorado State University. The work in the Punyadeera team was funded by the Queensland Centre for Head and Neck funded by Atlantic Philanthropies, the Queensland Government and CP is supported by QUT VC Fellowship. Corresponding authors: Email: chuck.henryedu; Phone: +1-970-491-2852. Email: wanida.Lac.th; Phone: +66-2218-1068.